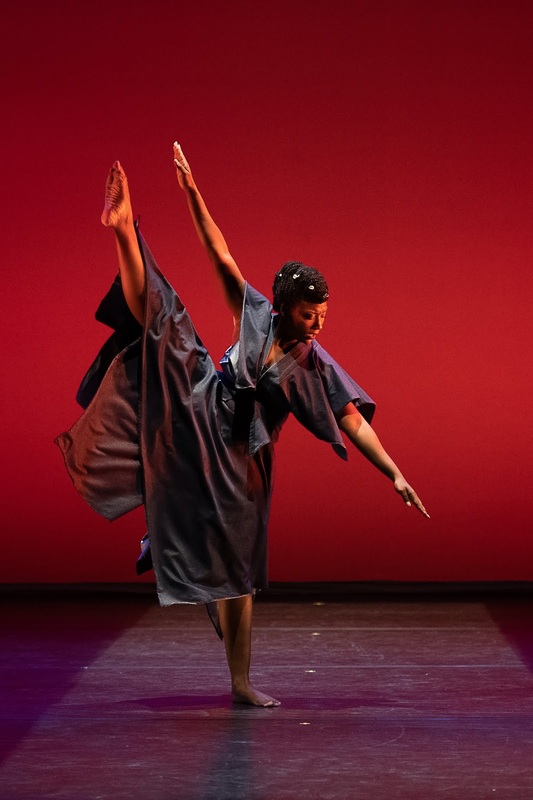 Ronald K. Brown/EVIDENCE, with its Afrocentric focus blended with modern dance movements, performed three very different offerings in its 90-minute program. The five woman and four men were individually expressive in their solos, but cohesive as an ensemble. As a choreographer, Brown remained true to his concept that dance can give “evidence” to the past (hence, the name of his ensemble) by celebrating African roots and traditions in his works. Danced to the inspiring music of human rights activists Nina Simone and Fela Kuti, “Come Ye” was by far the most powerful and dynamic of the performance pieces. The West African steps were skillfully performed, but with a freshness when juxtaposed with modern dance forms. Spirituality is an underlying theme in Simone’s lyrics: “Come ye who would have peace … who still have hope …. who would have love …” and these words were eloquently expressed through the dancers’ bodies. “Dancing Spirit” was choreographed as a tribute to Judith Jamison, best known as the Artistic Director of Alvin Ailey. The soloist’s white dress was reminiscent of Martha Graham, as she gave it life with her leg movements. Although well executed by the ensemble, this piece was overshadowed by the masterfully developed “Come Ye,” perhaps because it was only an excerpt of the original choreography and could not be fully appreciated in its shortened form. There was a repetitiveness of the steps and motions that dulled its impact. The debut of “New Conversations” was a collaboration of Brown with jazz composer Arturo O’Farrill. The newly developed score was performed by Resist, consisting of O’Farrill on piano, two percussionists, a flutist and tuba player. The tuba was not an enhancement to this otherwise interesting jazz score. The costuming for the women was unique, in that each was a different design but made of the same fabrics and hues. Two of the three men in this production wore identical pharaonic skirts, which neither seemed in keeping with the other costumes nor with the theme of the dance. The final bows brought forth all the dancers, musicians, the composer, and the famed choreographer. It was truly a celebration of community.